Add a few bacon rugs and it would be perfect: Sunny Side Up Shag Rug. It is a light. In a book. A pop-up book. So basically a pop-up light… Presented in such a beautiful way: A big (we are talking something like 16" x 12" / 41 x 30 cm) beautiful linen bound book (either red or grey) and if you open it, a lamp pop's up and starts to light up. Fantastic. You can choose between the traditional Lampshade or the Parisian Streetlamp. The Book of Lights retail for $95. It's a luxury shower that looks like a gas chamber: Multi-functional shower. It's also a steam room -- which explains the two seats. It also has LED lights for "chromotherapy." 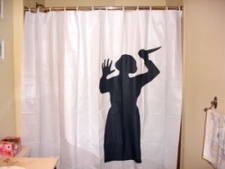 This is cool, if you are a Psycho fan: Psycho Shower Curtain. Either place this shower curtain facing away from the tub as a funny, decorative piece. Or, face it into the tub. When your "victim" takes a shower and pulls the curtain closed, they will get a frightening surprise. A hilarious prank to play on unsuspecting guests! ABC Vacuum Warehouse has the Eureka Boss SmartVac 4870GZ Vacuum for the Bottom Low Price of $149.99 with no tax and free shipping. A powerful upright vacuum with a 15-inch cleaning path, the Eureka Boss Smart vacuum has sealed HEPA filtration that captures 100% of dust mites, grass and ragweed pollen. This ultra-quiet model offers superior suction on both carpet and bare floors and comes with five deluxe on-board tools for amazing above-the-floor cleaning..
Buydig has the Hoover SteamVac All Terrain F7452900 Floor Cleaner for the Bottom Low Price of $249 with no tax and free shipping. The Hoover SteamVac All Terrain is designed to clean all types of surfaces in your home with a powerful 12 amp motor. The All Terrain includes a special hard floor package. The F7452-900 includes two sets of SpinScrub nozzle brushes, one for carpet cleaning and the other for hard floor cleaning. Add the hard floor brush and hard floor squeegee to the machine and you are ready to tackle hard surface cleaning from laminate to linoleum to tile floors. Special All Terrain model F7452-900 also includes a rubberized wheel set that makes maneuvering and traction easier on hard floors and carpets. Switching back to the carpet SpinScrub brush is easy and takes just seconds - then enjoy easier deep cleaning with the AutoRinse feature and Heated Cleaning technology. The 3 tank automatic detergent mixing system provides the correct mix of detergent and water for optimal cleaning results. The AutoRinse Feature rinses your carpet and hard floors, leaving less residue behind..
Bloomframe is an innovative apartment/condo/loft window frame which can be transformed into a balcony. The balcony gives the user a flexible living environment. Opening the Bloomframe window offers the possibility to step outside and enjoy the outdoor space. With one simple movement, light, air and space are added to the interior. The Bloomframe is designed and patented by Hofman Dujardin Architects based in Amsterdam, The Netherlands. A 50” panel with Amplifiers, DVD, VCR, Subwoofer, and 7 channels of surround can be concealed beneath a King size bed and a 42” panel and all the same equipment can be concealed under a Queen size bed. Both only take 45 seconds to deploy. VC Discounter.com has the Eureka Boss SmartVac 4870GZ Vacuum for the Bottom Low Price of $147.95 with no tax and free shipping. A new pair of shoes have been invented that vacuum as you walk. The Shoover - which makers Electrolux call the Dustmate - has a tiny rechargeable vacuum inside the base. The shoes are made of green nylon with a flexible rubber sole and elastic sock to fit any foot making it comfortable to wear. According to the Mirror a spokesman for Electrolux said: "We all have to vacuum our home - this product is designed for busy people who want to keep the housework down to a minimum. Dustmate provides a cleaning solution that doesn't take up any precious free time. "As you walk, the base of the shoes collect dust on the floor without requiring any effort. It is a simple yet creative cleaning concept."